I’ve not interviewed anyone for the blog before or hosted any guest appearances, so any shortcomings in the format are entirely down to me and my inexperience. But I believe I’ve definitely got something right – and that’s my choice of interviewee. I’m delighted and excited to be able to welcome YA fiction writer, Johanna Harness, to the blog. Johanna is the winner of the inaugural Christopher Al- Aswad prize set up in Christopher’s memory by Eight Cuts Gallery http://eightcuts.wordpress.com It is awarded for ‘outstanding contribution to breaking down barriers in the arts’. Johanna received the award because of what she has done by setting up and running #amwriting on Twitter. But, as you will discover, there’s more to #amwriting than its status as a very successful common interest group on Twitter – although that is awesome enough. Anne: So, welcome and congratulations on the award, Johanna. First of all, could you explain what #amwriting is and why you set it up? When I began #amwriting, I really had no idea it would become so big. There was no master plan. I knew I felt isolated in a way that I didn’t feel when I was teaching. I missed the collegiality with others who were doing the same work I was doing, so I started a twitter call-out at the beginning of my writing day. I’d chat and drink coffee until my fingers were warm and then we’d all dive into the words. Writers who joined us later would stay longer and greet others. It was really thrilling to watch #amwriting grow into a nonstop 24-7 conversation. We have over 2000 individuals posting every week from all over the world—and apparently a lot more who only read. The writers who post using the hashtag have so much enthusiasm and energy. It’s really a wonderful group. I don’t think anyone can plan for something like that. I’m thankful. Anne: How was it winning the award? What does it mean to you and for #amwriting? Johanna: At first I was a little confused. It never occurred to me an award could be attached to what I was doing. We had this big hashtag and I’d started compiling author biographies for members of the group. I still did my morning shout-out and looked for ways authors could help each other, but it always felt like we could be doing so much more. The Christopher Al-Aswad award came with an amazing prize: volunteers. In order to accept the help of others (which, clearly, I needed to do), I needed to better understand my own vision for the group. We could keep getting bigger on twitter, but I’d reached a practical level of difficulty with the author bios. I needed to put my writing ahead of developing the site and I had more bios piling up every day. I couldn’t get them all added. What we needed was a new site. Winning the prize helped me to tighten my focus. I had all these people willing to publicize #amwriting, to spread the word even farther, but I needed a website that could absorb that increased involvement. The member site we have now just opened December 1st. Anyone can become a member and post to group forums. Those who have been tweeting with #amwriting for a while are becoming authors on the site, posting new author bios as well as new articles for the blog. 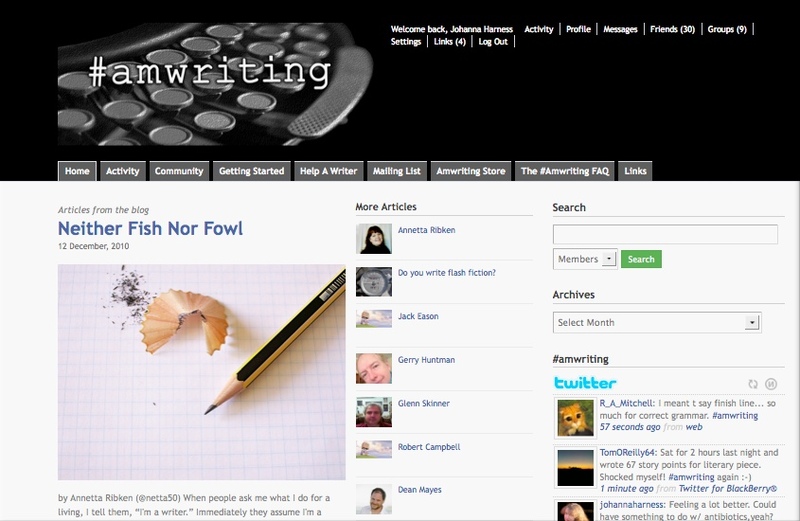 The focus of http://amwriting.org is community. I want growth to always flow from members helping each other. We’re still really getting started there and I keep holding my breath, hoping the site will hold together as more and more people join. So far, so good! Anne: You have a wonderfully refreshing and open attitude to writing and writers – you say on your website http://www.johannaharness.com that ’you’re an author once you author something’. That is a very affirming and validating thing for a writer to hear. What would you say to those who say you must be traditionally published to be able to call yourself an author? Johanna: I really have no patience with limitations. You can’t do that or you can’t say that or you can’t be that. Who says? We each have the responsibility to make the most of our individual potential. That’s all there is. How you define your potential is entirely up to you. For every rung up on your personal ladder of success, there will be people pulling you back down, filling your space with negativity. If you stop to address every one of those people, you’ll lose sight of your goals. So what do I say to those who would define writing or authorship in a narrow way? Nothing. Nothing at all. I keep exploring my potential and I keep encouraging others to do the same. Life is too short! Anne: Tell us a bit about your own writing? How did you get into writing, what does it mean to you and what sort of things do you write? Johanna: I write young adult and middle grade fiction. I started writing seriously a little over two years ago. My dad’s death had an enormous impact on me, making me realize that I really didn’t have all the time in the world for my someday-goal of becoming an author. If I wanted the dream, I had to put in the time. I’ve worked on my writing in one way or another every day since then. Most recently, I’ve been working on revising my young adult novel, Claire Morgane Almost Saves The World. 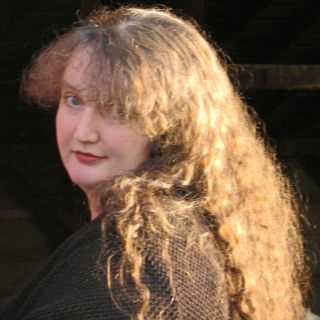 I have a series of short stories based on Claire’s early life available on my Claire Morgane website (http://clairemorgane.com). I talk about recently signing with a literary agent on my author blog (http://johannaharness.com). Thanks so much for this opportunity, Anne! And thank you to you too, Johanna, for taking the time to collaborate on this post. I urge all readers of this blog, who are also writers, to visit the #amwriting community on Twitter and the amwriting website – then you will truly appreciate Johanna’s awesome achievement – from its small beginnings to its present wide-ranging, supportive and influential status. Thanks, Dan. Glad you like the piece. Yes Johanna and #amwriting are amazing. Johanna is a terrific example of what a writer (or author) is – one who writes and, in Johanna’s case, supports and encourages others in their writing. Great interview (both -er and -ee). Thank you, I’m glad you enjoyed the interview. It was a first for me but I think I chose a ‘can’t fail’ subject in Johanna. That is a fine piece about about a fine project(and really nice person) that makes a huge difference to a lot of people. Thanks for looking in. Yes #amwriting is truly a fine project. All of us writers owe Johanna a debt of gratitude. I’m new to the #amwriting group – didn’t know all that was behind it when I started tweeting to it! The new site is very exciting! I’ve peeped in often and am looking forward to getting more engaged. Looks like a very friendly and supportive group. Thanks for stopping by and leaving your kind comments. Yes the new site looks fabulous doesn’t it.